As you read this we are probably starting the first day of painting in the Algarve. We’ll be away for a couple weeks, so I thought this is a chance to post something from the archives. 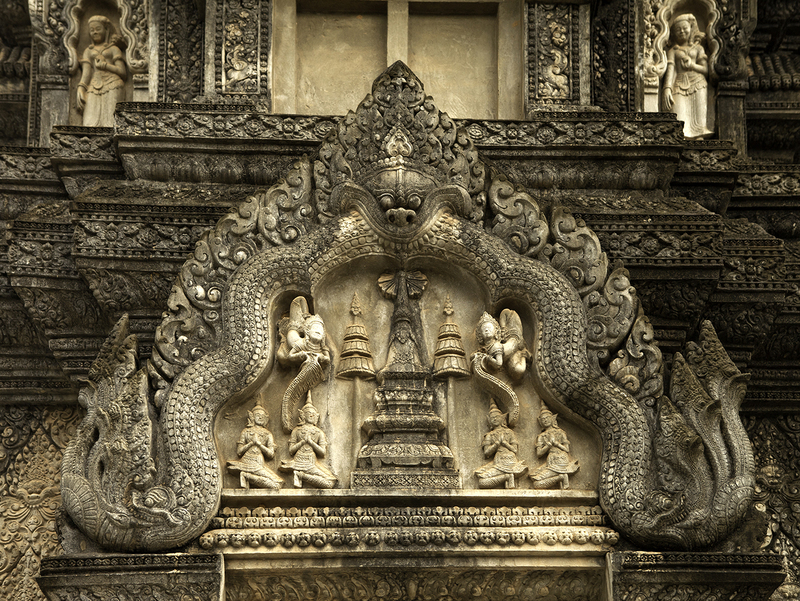 Let’s go back to last July’s trip to the Khmer temples in Siem Reap Cambodia. Immediately after the 2015 USK Symposium in Singapore, we spent a week touring with some of the other workshop instructors. I’m sure followers of Urban Sketching blogs remember the coverage from people like Suhita Shirodkar, Stephanie Bower and Shari Blaukopf. At the symposium I’d been teaching about sketching people at high speed. 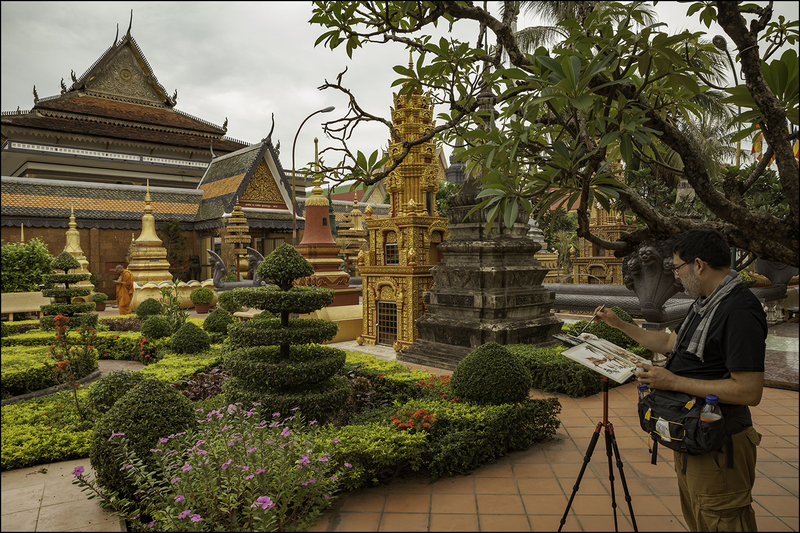 But we’d also been exploring the city in our free time, getting used to the realities of painting in extreme humidity. By the time the official programs were over, I was excited for the next leg of the trip – but I also felt like half a burned down candle. Big workshops are an overdose of activity – all of the painting and drawing, combined with the social buzz – it can be exhausting. 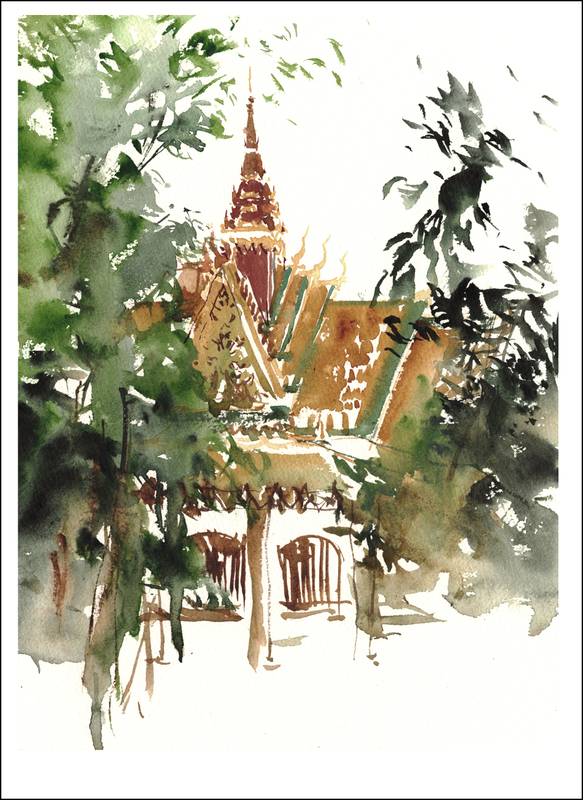 So the plan for Siem Reap was simply to paint every day. I wanted to do nothing else besides exploring the temples with my watercolors. No doubt there are other things to do in town. There are local arts and crafts, there’s dance and theater. There is great local food. Certainly there are fascinating markets full of street life and exotic goods. But by then I was into my zone of simply painting for myself. So what can I say about visiting Angkor Wat and the surrounding temples that hasn’t been said before? When visiting any great archaeological site, we are reminded that no matter how impressive our modern accomplishments (the iPad being the greatest I can think of right at the moment) humans have been constructing epic monuments for thousands of years. The level of artistic achievement and the complexity of the engineering are so astounding that the modern mind isn’t even able to take it seriously. Think about the generations of effort invested in transforming the landscape on this scale. 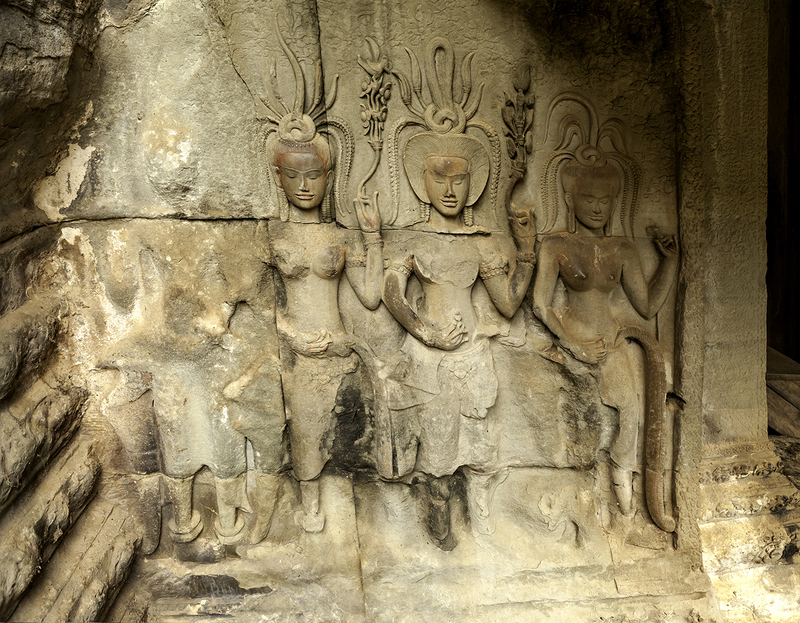 The huge reservoirs dug out of the jungle, the massive stone temples with every surface covered in sculpted carvings. I have a hard time imagining how it could be accomplished. In our modern society, where we can’t even agree to vaccinate children, it seems like cooperative effort on this scale is something out of the question. Something humanity may never see again. You get the feeling, when walking here, that this is a thing we have lost. We may never again see a culture reach these artistic heights. I don’t mean to be romantic about it. I’m sure the reason ancient kingdoms were able to build this way had everything to do with theocratic dictatorships and the iron rule of warrior kings. You probably need a huge population of let’s-just-call-them-slaves. There is no time to worry about universal health care and education. Never mind the OSHA. But it’s easy to brush that aside when you’re there, and simply marvel at the place. I often wonder, if these beautiful complexes were actually used by the people – or if they were gated palaces only for the privileged few. 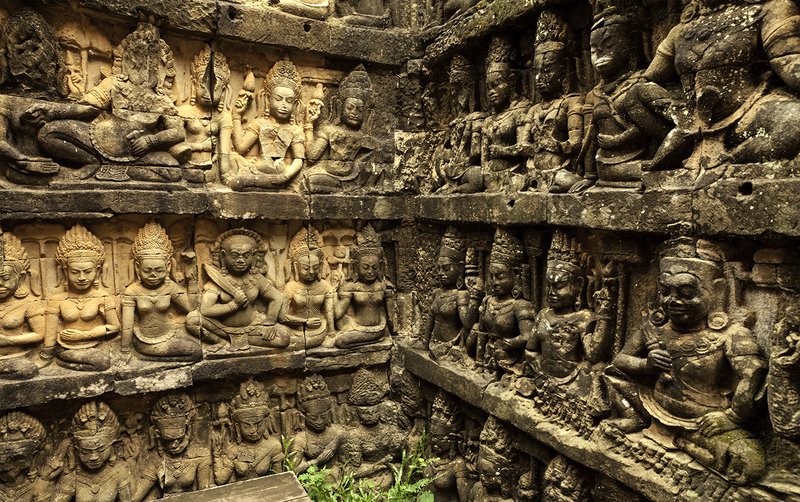 Who got to see these miles of relief carvings? Who was living in these halls lined with row on row of statues? Was it only a few saffron robed priest-kings living in luxury? or were the stone courtyards packed with people, animals and wooden houses – a chaotic village crammed inside the walls? Today it has an abandoned feeling. I prefer to imagine these empty places packed with a riot of color. If you spend any time in the modern day temples in Siem Reap, you get a sense of that barely contained energy. The way every inch of space is used for color and decoration. There are very few solemn monastic courtyards in the bustling streets of a living Asian city. 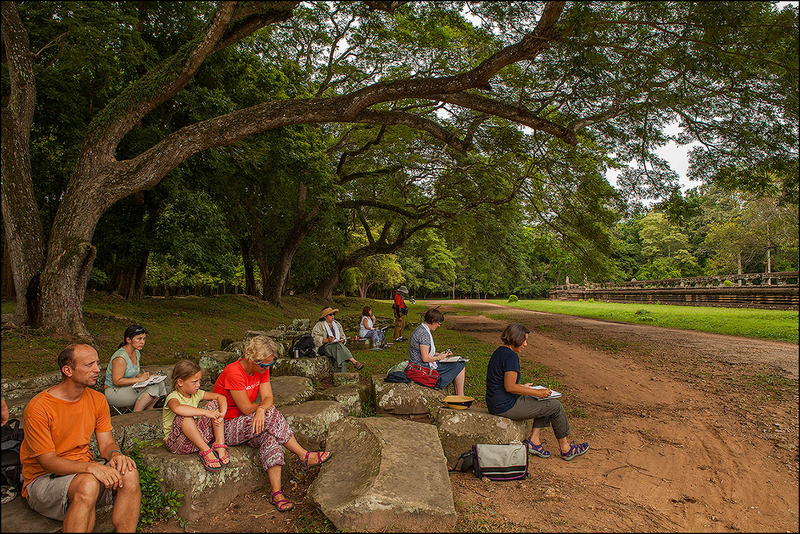 Is that the lovely Liz steel I see in the photo captioned [Painting Angkor Wat from the east side]? Yes! That’s Liz! We always try to do a few days sketching around a workshop – if we can. I don’t know if we’ll synch up for Manchester though :P What with us being in Ireland before then returning more directly. Breathtaking scenes! And you captured them so beautifully. Lots to think about in your comments. Yes, who did walk on these grounds? Beautiful drawings. Thank you. Very profound – such awesome structures and what a privilege to have these interpreted directly from your hands to our eyes. If more people were aware of all this beauty perhaps they wouldn’t be so caught up in their myopic concerns. Artists can certainly play an important role in shifting one’s viewpoints and offer new perspectives! Thank you Marc. We haven’t met, not even over the tech waves (but I do have one of your Craftsy courses to do). Just writing to say what a marvelous piece you have written about the places you visited in Cambodia last year. My mind was abuzz with thoughts and questions and you just answered those the further I read. Great article, great photos (your wife’s I believe) and great sketches. Why thanks very much Margaret! It is so lovely seeing Ankor Wat again. 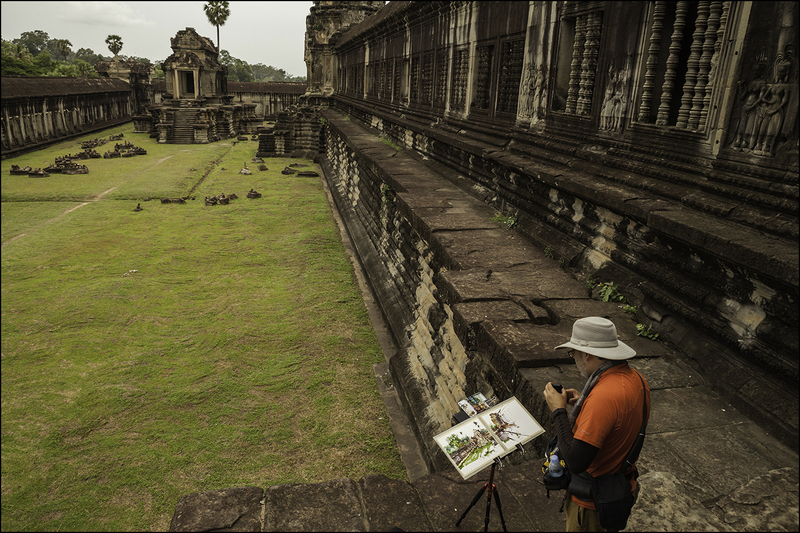 My daughter, a photographer, took the picture I’m including in Ankor Wat and like others said to me…..Who emptied Ankor Wat? It is always so full of people. When people saw what my daughter was doing they waited and staged their own…it was great. Next time I bring paint! Hi Marc, I’m a Craftsy person also and love your classes there. I refer to them so much. I really love the way you leave some of the drawing and paint other parts in. These are really beautiful! Marc, Love your work and want to explore all watercolor sketching with no setup and no pen. BUT, what to do with the 10-15 minutes between washes. What do you do to fill this time? Hey Larry – I assume you mean the drying time? For that I try to move systematically around the image so wet edges have time to dry. So, for instance I’ll do sky, then ground, leaving out a building – then by the time that’s done I can usually go into the negative space and edges don’t merge. (Unless you’re painting in Singapore when its 110% humidity). The other way is to leave even the tiniest sliver of white paper between, and that stops the flow of water. Make sense? It boggles my mind that these temples although large is not even close to the size of the man made reservoirs they constructed!! Considering this was the largest city in all of human history prior to the Industrial Revolution just adds up to the scale and size of the whole place. I believe Angkor was just the religious center of the whole Empire not including countless other ancient cities they constructed with the same scale and magnitude. I felt the chills down my spine seeing them.